Andrographis paniculata is a traditional medicinal plant widely used in South-east Asia. It is cultivated from seed; however, seed germination—even of viable seeds—is unreliable. Understanding the factors controlling germination would enable growers to devise means to improve the efficiency of cultivation. 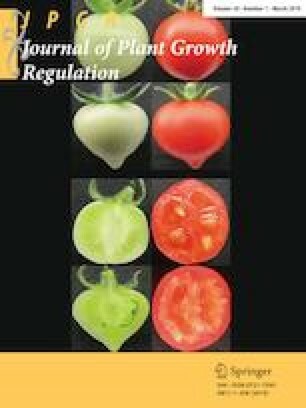 In this study, the transcriptome changes at three time points in A. paniculata seed germination process, namely 0, 28, and 48 h after sowing were analyzed using high-throughput mRNA-sequencing assay (RNA-seq). A total of 198.5 million clean reads were generated and assembled into 84,749 unigenes by merging the de novo and reference assemblies. Transcriptome comparison analysis revealed that the majority of transcriptome changes occurred in the early stage of the germination process. Gene ontology (GO) and Kyoto Encyclopedia of Gene and Genomes (KEGG) pathway analyses indicated that the differentially expressed genes are mainly involved in butanoate, galactose, glycerophospholipid, and carbon metabolism, and in plant hormone signal transduction. Remarkably, the expression levels of genes involved in gibberellin, abscisic acid and ethylene metabolism, and signal transduction were altered in the germination process. Expression of genes related to gibberellin catabolism was down-regulated, expression of genes related to ethylene signal transduction was activated. Especially, in the initial stage of germination, there was a high expression level of NCED5. This abscisic acid biosynthesis-related gene may play a key role in restraining seed germination. The transcriptional expression levels of related genes were verified by qRT-PCR analysis. That means the critical roles of hormone metabolism and signaling transduction in the germination of A. paniculata seeds were found. On a practical level, the results suggest that gibberellin or/and ethylene treatment in combination with presoaking seeds in warm water may effectively promote germination. This study is the first global overview of gene expression involved in seed germination of A. paniculate and provides transcriptome data for further research on the molecular regulation mechanism of seed germination. The online version of this article ( https://doi.org/10.1007/s00344-018-9839-2) contains supplementary material, which is available to authorized users. This work was supported by the National Natural Science Foundation of China (Grant No. 31401277); the Youth Elite Project of Guangzhou University of Chinese Medicine (Grant No. QNYC20140113).